After a long time away from the tessera and tools I’ve managed to get back in touch with my materials and produce a new set of coasters. Produced in my usual way (10 x 10 cm and felt backed) these four coasters feature a winter scroll effect. I’ve used terracotta and blue to try to create a frosty leaf effect, something I hope is aided by the sharp nature of the tesserae shapes. 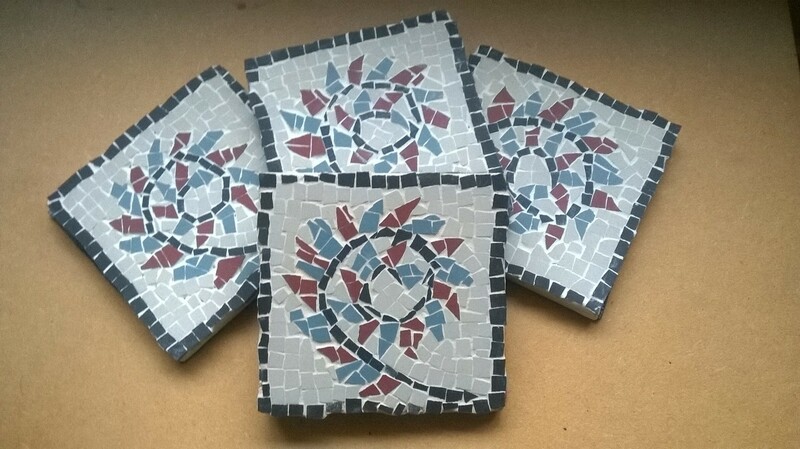 The idea for this pattern came from the the widespread use of leaf scrolls found across a variety of Roman mosaics, however given that it was winter when I designed them I decided to make them thus, a contrast to the much warmer spring/ summery coasters depicting flowers that I made last year. Now that I’m back with my tesserae I have plans for more mosaics and hope to share them in the near future.